Not only can transposable elements interrupt genes or disrupt their regulation, but they can cause additional rearrangements in the genome. Homologous recombination can occur between any two nearly identical sequences. Thus when transposition makes a new copy of a transposable element, the two copies are now potential substrates for recombination. The outcome of recombination depends on the orientation of the two transposable elements relative to each other. 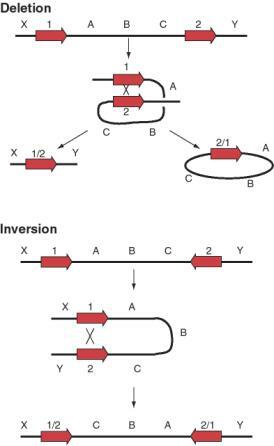 Recombination between two transposable elements in the same orientation on the same chromosome leads to a deletion, whereas it results in an inversion if they are in opposite orientations (Fig. 9.18). Figure 9.18. Possible outcomes of recombination between two transposable elements. The preference of the retrotransposition machinery for LINE1 mRNA does not appear to be absolute. Many processed genes have been found in eukaryotic genomes; these are genes that have no introns. In many cases, a homologous gene with introns is seen in the genome, so it appears that these processed genes have lost their introns. It is likely that these were formed when processed mRNA derived from the homologous gene with introns was copied into cDNA and reinserted into the genome. Many, but not all, of these processed genes are pseudogenes, i.e. they have been mutated such that they no longer encode proteins. Other examples of active processed genes have inserted next to promoters and encode functional proteins.